Questions for Littles: What did God do to Noah and his sons at the beginning of Genesis 9:1? What does He command them to do? What has God now put upon the animals (Genesis 9:2)? Upon how many of them and what kinds? What does He give them to eat (Genesis 9:3)? How many of them? 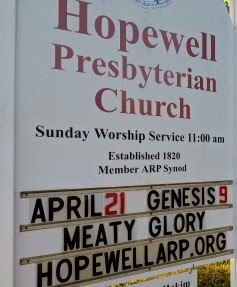 What/how must they not eat any animals (Genesis 9:4)? What does God refer to as an animal’s life? For what does God demand a reckoning in Genesis 9:5? What reckoning, specifically, does He demand in Genesis 9:6? What reason does He give? What commandment does He restate in Genesis 9:7? In the Scripture for this week’s sermon, we saw the what, how, and why of God renewing the creation mandate in His redemption plan. The “what” of the creation mandate was to fill creation with little images of God. Now, since we are all sinners, this means not just people but redeemed people. If we are fruitful and multiply and few come to faith, then instead of filling the earth with pictures of God’s life in Christ, we would be filling the earth with pictures of the death that we all died in Adam. The “how” of the creation mandate was by God’s provision and power. He gives us all that we need. Breath, light, clothing, physical life, even meat to eat! And, He reminds us that His power is sufficient. Sufficient to sustain the animals—even as man “takes a bite” out of them. Sufficient to sustain the people. But even more than that—that God’s life is our life. Jesus’s life is the provision for us to live instead of die. Jesus’s life is the power by which we live. The “why” of the creation mandate was because God loves to display Jesus as His glory. And God’s chosen way of displaying Jesus as His glory is to display Him as our Savior, and to display the difference that He makes in those whom He saves. This has huge implications. There is no such thing as “just a human being.” There is either “a display of the death and shame of Adam” or “a display of the life and glory of Christ.” So the first thing is to know that your life is all about who Jesus is. But, if that’s the case, then everything we do every day is an opportunity to display His glory. And everyone whom we encounter is potentially another one in whom Christ’s glory can be displayed, day by day and for all eternity! In what part of your life do you have the most difficulty remembering that you are to be a display of Christ’s glory? How will you remind yourself? Whom do you know that needs to see Christ’s glory? What will you do to help them see Him? First, man is given permission to kill animals to eat them. Likely, this was already being done, but as God states in Genesis 9:3, He hadn’t authorized this until now. Second, God makes it clear that man’s life is to be valued as the most precious thing in the creation. But notice the reason why—not in and of itself, but because man is created in the image of God. In fact, if a man assaults the image of God by taking another’s life, then it is precisely out of respect for the image of God that the murderer himself is to be executed. This helps us to understand why God Himself makes a big deal out of us being fruitful and multiplying—because we are a display of Him in His creation. So, yes, on the one hand, if we took this to heart as a society, we would probably have many more large families. But do you know what else we would have a lot of? Evangelizing those children in corporate worship, family worship, and personal discipleship and discipline. Would it really be valuing them as created in the image of God if we disregarded their eternal souls?! This also means that we have a much more important way of honoring God’s image in our neighbor than merely declining to murder him. The Lord elsewhere puts the command in the positive form—to love our neighbor as ourselves. And there is no more important way to do this than to tell our neighbor the gospel of Jesus Christ, praying that the Christ of the gospel would send His Spirit to give life and faith to that neighbor. Heaven understands this priority upon the image of God—all of heaven rejoices over just one sinner who repents! And so should we! Whose eternal souls are you especially praying and working to see saved? What activities would result from treasuring God’s image in yourself? Whom could you be treating better? Questions for Littles: How many days before Passover does chapter 12 begin (John 12:1)? Where did Jesus come? Who lived there? What had Jesus done for him? 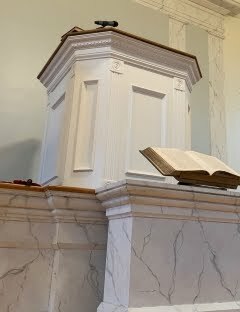 What did they make for Jesus (John 12:2)? Who sat at the table with Him? What did Mary use to anoint Jesus’s feet (John 12:3)? How did she wipe them? What filled the house? What was Judas one of (John 12:4)? What was he going to do? How much did he think they could get for the oil (John 12:5)? What did he say could be done with the money? But why did he really want more money in the money box (John 12:6)? What did Jesus say she was keeping and using the oil for (John 12:7)? Whom did Jesus say they would have with them always (John 12:8)? Whom did He say that they would not always have? How many Jews knew that Jesus was there and came (John 12:9)? Whom else did they come to see? What did who plot in John 12:10? Why (John 12:11)? In the Gospel reading this week, Jesus gets ready to be buried. That sounds like an odd way to start this devotional—in part, because Jesus isn’t dead yet. Ordinarily, someone dies before they begin to embalm Him. However, Jesus’s death was no ordinary death. He just finished, a couple of chapters ago, saying, “Therefore My Father loves Me, because I lay down My life that I may take it again. No one takes it from me, but I lay it down of Myself. I have power to lay it down, and I have power to take it again. This command I have received from My Father” (John 10:17-18). So, Judas is plotting to betray Jesus. And the chief priests are plotting to kill Jesus. But Jesus Himself is plotting to die, and this is the means by which He is going to do it. And here He has come to be prepared for that—both by the perfume of Mary and by the praise of the Jews here in Bethany, which praise will be a part of getting the ball rolling. Here is God Himself, who has become a Man, to lay His life down for us. Our being created in His image is the very reason that part of godliness is to care for the poor—to declare by our heart and behavior that the important thing about a man is the image of God. Of course, there are selfish reasons to care for the poor. Like Judas, who couldn’t care less about them or even about Jesus Himself—but “charity” was pretty profitable for him. There are still people like that. And we ourselves are tempted to exercise charity just for that good feeling it gives us, or perhaps to appear good to others. We have quite the capacity for self-deception… how dull-witted do you have to be to plan to kill the guy who just rose from the dead? So, what is a good way to gauge whether we do even “good deeds” from false motives? Well, the passage sets one before us: are we eager to give Jesus the best. The best of our time. The best of our thoughts. The best of our efforts. The best of our love. And yes, even the best of our money. Of course, the good news is that even though our motives will never be pure on this side of glory, Christ’s motives were! And it is His motives that are counted for us as if they were ours, when we believe in Him. For, believers know that it was because our sin was counted as if it was His when He died for us. Hallelujah! What has Jesus done for you? How does this make you feel toward Him? What’s the most precious thing that you have? How can it be used to serve Christ? Questions for Littles: In what has Paul and his team found comfort (2 Corinthians 7:13)? Whom else’s joy has made them rejoice? How much? What made Titus rejoice? To whom had Paul and company spoken all things in truth (2 Corinthians 7:14)? To whom had he boasted about the Corinthians? Did those boasts come true? What two things have increased Titus’s affection for the Corinthians (2 Corinthians 7:15)? In what does Paul say he has confidence in the Corinthians (2 Corinthians 7:16)? Now, in 2 Corinthians 8:1, about whom is Paul boasting? What are their circumstances (2 Corinthians 8:2)? Of what do they have an abundance? What are they deeply in? In what did this poverty abound? According to what did they give (2 Corinthians 8:3)? Beyond what did they give? How intensely does 2 Corinthians 8:4 say that they asked the apostle to do something? What did they ask him to do? In what did they want to have fellowship? To Whom had they given themselves first (2 Corinthians 8:5)? And then, as a result, to whom? By whose will did this happen? Who had been making this collection from the Macedonians (2 Corinthians 8:6a)? From whom also did Paul urge Titus to continue collecting (verse 6b)? In what five things does the apostle say that they abound (2 Corinthians 8:7a)? In what does he now exhort them to abound (verse 7b)? What does he mean by “this grace”? In this week’s Epistle reading, there is much boasting going on. The Macedonian churches sound pretty amazing. In great trial of affliction, they have overflowing joy. In deep poverty, they give with overflowingly rich generosity. Upon first reading, one might wonder whether these churches are riddled with flaws like all of the churches that we have ever been a part of. But then, we might notice what the apostle has to say about the Corinthian church. Sure, there have been hints of good things here and there (particularly recently); but on the whole, my or your first description of this congregation might not have been “abounding in faith, speech, knowledge, diligence, and love.” Even if it were suddenly amazing (looking at the way he feels compelled to appeal to them in the rest of the letter, I’m not convinced that it was), the Corinthian church’s average rating on the internet might have taken quite a bit longer to recover than this. Grace! That’s why the apostle is exceedingly gladdened and comforted by every glimmer of anything good in the Corinthians (and Macedonians). Because it is the fruit of the almighty power of God, exercised in the infinitely merciful grace of God! May God give us grace—to abound with joy over every evidence of His grace in others! Over whom in your church do you have difficulty rejoicing greatly? What are some evidences of grace in them over which you can rejoice? Questions for Littles: Whom did Joshua gather in Joshua 24:1? For whom did he call? Before whom did they present themselves? Who is saying the words that are coming out of Joshua’s mouth (Joshua 24:2)? Who dwelt on the other side of the river? When? What did they do there? In Joshua 24:3, what four things does the Lord mention having done for Abraham? What did the Lord give Esau in Joshua 24:4? But where did Jacob and his children go? What did the Lord do there (Joshua 24:5)? Whom did the Lord bring out of Egypt (Joshua 24:6)? To where did they come? Who pursued them? To whom did the Israelites cry (Joshua 24:7)? What did He do? Then, where did the Israelites dwell for a long time? What happened with the Amorites on the east side of the Jordan (Joshua 24:8)? Who then arose against Israel (Joshua 24:9)? Whom did he call to do what? What did the Lord make Balaam to do instead (Joshua 24:10)? From the hands of which eight groups does Joshua 24:11 mention Yahweh delivering His people? What is one thing that the Lord used to deliver them (Joshua 24:12)? What does He say He did NOT use to deliver them? What four things does Joshua 24:13 say that God gave them, but that they did not have to produce? What does He, therefore, command them to do (Joshua 24:14)? Whom does He say to put away? Whose gods does Joshua suggest they might serve in Joshua 24:15? After reading the first fourteen verses, why might those gods be poor choices, even from a worldly perspective? Whom does Joshua say he will serve? Whom else does Joshua say will serve Yahweh? In this week’s Old Testament reading, the Lord reminds His people about the god-battles that are part of their history. The gods of Egypt couldn’t deliver them. The gods of the Amorites couldn’t deliver them. Balak of the Moabites was smarter—he tried to have Yahweh on his side, but the Lord refused. The gods of Jericho couldn’t deliver them. The gods of the Perizzites, Canaanites, Hittites, Girgashites, Hivites, and Jebusites couldn’t deliver them. But Yahweh? He delivered Israel. And delivered them. And delivered them. And delivered them. Can you imagine? Hornets rising up against you? And hailstones (cf. Joshua 10:11)? It would seem like the entire creation was up against you. But it was actually even worse: the Creator Himself was against them! For Israel’s part, the reverse was true: the Creator Himself was for them! And He surrounded their lives with evidence that He is for them. Their land that they did not labor either to clear or to possess. Cities that they did not build. Vineyards and olive groves that they did not plant. Wells that they had not dug (cf. Deuteronomy 6:11). So the same choice faces us today. Nothing else and no one else, that others trust in or live for, can deliver them or provide for them. But Yahweh, Jesus, has given Himself for us. Will we give ourselves to Him who gave Himself for us? Or will we reject all of the evidence around us and decide that we’d like life better trusting something/someone else and living for something/someone else? In what do you tend to trust, instead of the Lord? In what do you tend to delight, instead of the Lord? For what do you tend to live instead of the Lord? What are a couple of your favorite things? What would it look like to enjoy them as from the Lord and use them as for the Lord?